The fundraising target of £30,000 to save the Blue-throated Hillstar has been reached in less than two weeks, thanks to a rapid response from World Land Trust supporters to the plight of this critically endangered bird. By donating to help save the Blue-throated Hillstar’s habitat, our supporters were securing a future for this species and perhaps some that have not yet been discovered. 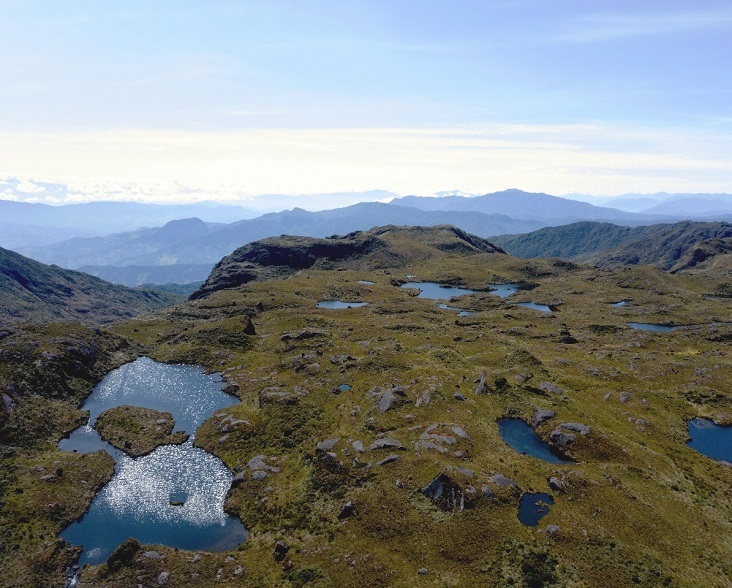 All the funds raised will go towards the protection of the hillstar’s habitat (70,000 acres) and our partner Naturaleza y Cultura Ecuador’s (NCE) work with local communities to ensure the sustainable future of this protected area. Thank you to everyone who supported this urgent appeal. Recognised by its glittering, ultramarine blue throat, this hummingbird is a very rare sighting that can only be experienced deep in the western Andes of southern Ecuador, on a few remote mountaintops. This latest discovery brought the total number of hillstar hummingbird species to seven. Hillstars are a remarkable type of hummingbird adapted for living at high elevations in the Andes. The males are easily identified by their iridescent throats in bright colours of green, purple or blue. The Blue-throated Hillstar’s known range is very small and restricted to the páramo (alpine shrubland) habitat of a few mountains in the western Andes. This unique páramo habitat is under threat. Mining companies currently have the right to mine key areas for metal deposits, which would most likely be extracted through open-pit mining. This would be a disaster for local wildlife. The habitat is also threatened by manmade fires lit by cattle ranchers to ‘revive’ the grassland for pasture and encroachment from non-native pine trees from neighbouring timber plantations. This land is owned by the local communities, who are actively supporting its protection as they rely on the clean freshwater collected in the mountain ecosystem. They have been working with our partner NCE and the Water National Secretariat (SENAGUA) to create one of Ecuador’s first Water Protection Areas. This will give the ecosystem one of the highest legal categories of protection in the country and provide water for at least 470,000 Ecuadorian people. 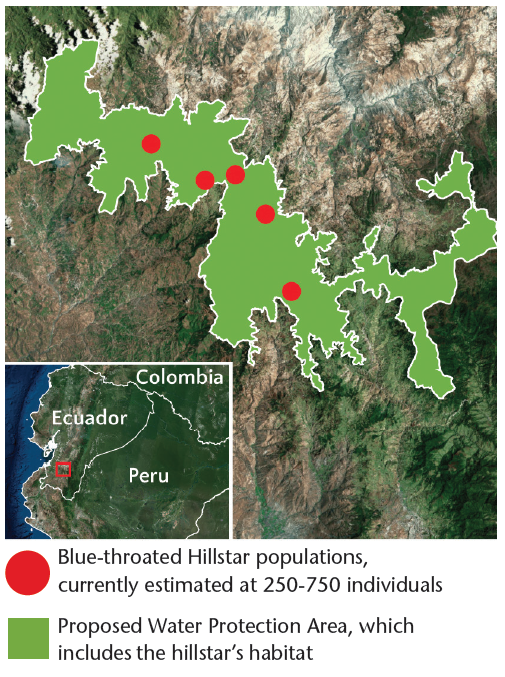 NCE’s proposed protected area is currently 195,000 acres (79,000 hectares), but with the funding from this appeal, it can be extended by about 74,000 acres (30,000 hectares) to include the range of the Blue-throated Hillstar. These mountains are still relatively unexplored by naturalists and researchers, and by protecting them, we may find many more species waiting to be discovered. As well as the Blue-throated Hillstar discovery in September 2018, a new species of frog, the Tik Tik Rain Frog, was also discovered last year, found in the eastern corner of the proposed protected area. This habitat is also important for larger Andean species such as the Spectacled Bear, Mountain Tapir and Andean Condor. By donating to help save the Blue-throated Hillstar’s habitat, our supporters were securing a future for this species and perhaps some that have not yet been discovered. Click here for a printable PDF with information about this project.